Early in my quilting career I discovered Quilter's Attic in Goodlettsville, TN, the closest local quilt shop at the time. I don't recall where I heard of them but I do remember that in 2001 I purchased the fabric for my first finished quilt (Double Pinwheel) there. That's also where I learned about my first guild from a little brochure next to the cash register. While the shop has changed hands a couple of times, it still thrives in the ancient building that is it's second home. Bethany Reynolds had just introduced her Magic Stack 'n' Whack technique a few years before and I was intrigued by the kaleidoscopic look of her designs. When a class was being offered at Quilter's Attic, I jumped at the chance. I must have had the fabric requirements in mind when I purchased the fabric -- a very large calla lily on a dark purple background -- because otherwise I can't imagine why I would have bought such a large amount of such a bold print! The pattern we used was "Half-Square Triangle Magic" from Bethany's first book. After we mastered the stacking and whacking, construction of the blocks began. 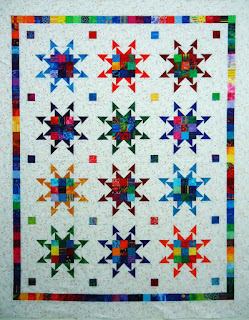 If you've ever done a kaleidoscope quilt you know how addictive it can be, wanting to see how the next block will look. I had no idea what to use for the background. In fact, the teacher recommended we wait till we had a few blocks mocked up before choosing a background (more sales for the shop!). All I could find that supported the colors in the blocks was a bold yellow with a purple dot in it. Decision made, construction continued. After I had the blocks made I was auditioning their position in the quilt on the den floor with help from my husband. Since none of these colors was in my home's decor, either then or now, I made the comment that I didn't know WHO could possibly want this quilt. To which my husband replied, "you're not giving that quilt away!" When I proudly showed the quilt at the next guild meeting, someone in the back of the room said, "I would never have used THAT fabric!" I assumed she was referring to the background. I was hurt and it was a long time before I ever showed anything again. (Note to Self: be careful what you say about a quilt.) Now, with the passage of time, I want to interpret her comment as a compliment, as in "Wow, I would never have thought to use such a lovely fabric in the background!" It's been almost 15 years and my husband naps under that quilt every day. 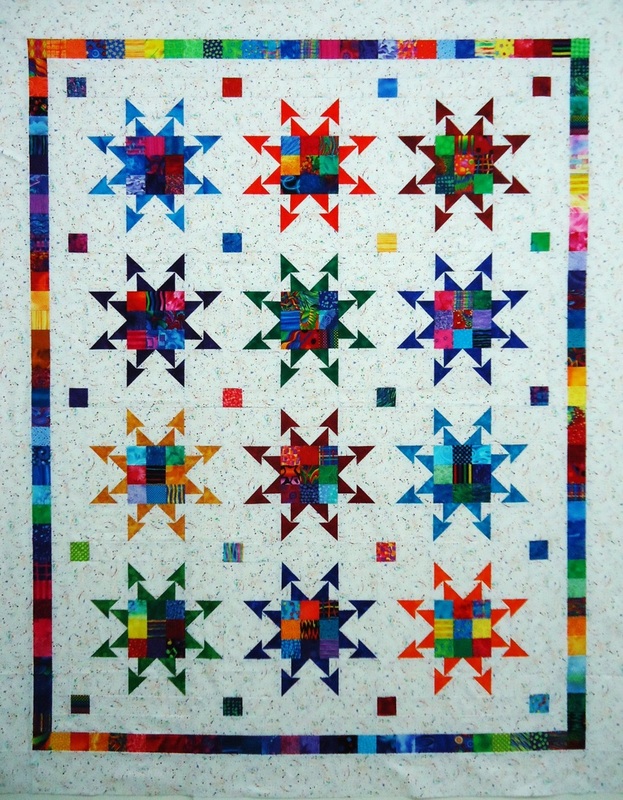 Linking up with Krista Quilts and Jen at A Quarter Inch from the Edge for Throwback Thursday. Do you go through color "phases"? I am currently in my "gray phase." Seems I simply can't get enough gray ... and yellow. While I had accumulated a few pieces of gray/yellow fabric in the last few years, my recent purchase in Indianapolis has kick-started a gray/yellow fever in my soul. I used this little bundle to make samples and step-outs for the Exploding Pineapple class I taught last week at Quilt Camp at Cedar Lakes. This is what's on my design wall this Monday morning. I liked what I was doing so well that I enhanced my collections of grays and yellows with stops at Tennessee Quilts in Jonesborough and Heavenly Stitches in Kingsport, TN. And since I needed gas in Bowling Green, KY, I took the opportunity to stop in at Whittle's. Yep, you guessed it -- more gray and yellow. It does seem that travelling is my downfall. If I'd just stay home and sew I'd use it up ... maybe. Heaven help me, I'm going to Shipshewana, IN in 3 weeks. Lolly's here I come! My second class was French Braid. Students could select any one of the 14 projects in Jane Hardy Miller's first book, French Braid Quilts. We had three or four different projects going in a variety of fabrics. Our goal was to finish one or two braids and get at least one separator strip attached so that all the steps would be covered in class. Betty stitched late into the night and finished a small top, but she decided she would add another braid (or two) to make it bigger when she gets home. Unfortunately time was our enemy and not everyone got that far, but we had a great time with some really exciting projects in the works. 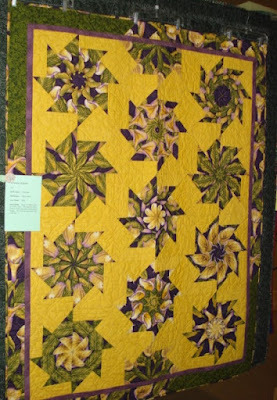 To me, the best part about Peg Bingham's Quilt Camp at Cedar Lakes is the 2-day classes. There is enough time for me to do some in-depth teaching and time for the students to get a lot accomplished. My Monday-Tuesday Class was Exploding Pineapple. The pattern is in Karin Hellaby's booklet Sew Simple Pineapple. It is not a traditional pineapple block. There is no special ruler required, no paper to tear off the back. Instead, it's constructed from a series of squares in graduated sizes. Start with two squares the same size, right sides together. Stitch around all 4 sides, cut the top square diagonally in both directions and peel the resulting triangles back like the petals of a flower. Add another square of this new larger size and repeat. Yes, it's mindless, repetitive sewing, but sometimes that's just what we need. The hardest part is deciding which 6 fabrics you're going to use in any given block! There was quite a variety among the students, from 19th century repros to modern brights. And organization went from 2-color combos to totally scrappy. We were shooting for 80 blocks; finishes ranged from 20 to 60 (she worked the extra 2 days). I can't wait to see the finished projects! I was greeted at the Administration Building where I picked up my credentials and gift bag. In addition to the Camper's Handbook we received a nifty screw driver/flashlight combo, measuring tape, and a cute pin that says Rippity doo dah! I had time to organize my classroom before the evening welcome festivities. I was assigned a space in the Craft House that usually serves as the cooking classroom for Future Homemakers. Other than a little lot of noise from the freezers, the room was spacious and served us well. After dinner we reported to Assembly Hall to be welcomed by our host/organizer, Peg Bingham. Eight vendors lined the outside walls of the assembly room, offering everything from fabric to patterns, to notions. After Peg welcomed the 200+ campers, a parade of quilts from home followed. Most people showed completed projects from last year's classes, including Peggy who showed her finished Wink & a Smile from my 2014 class. See how Peggy's sashing changes the look from the pattern! Returning to Cedar Lakes is like coming home with hugs from old friends and nervous smiles from new campers. I had two terrific classes with such pleasant and accomplished students. More reviews to follow. Quilt Camp 2015 is over and I am happy to report that both of my classes went well. I had enthusiastic students who accomplished alot and had a great time doing so. Scroll down through some of my last posts to see more. 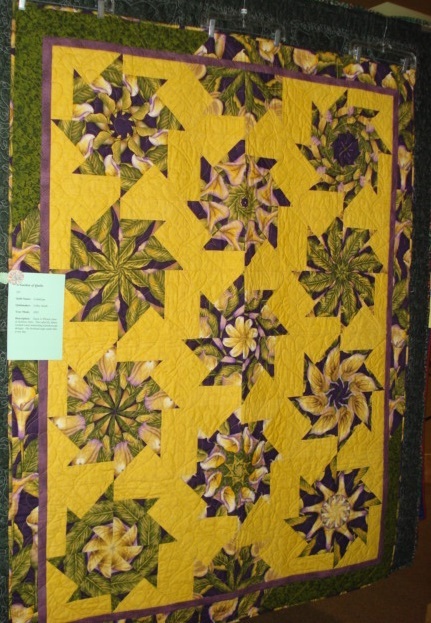 The first two nights of Quilt Camp we have show-and-tell from home, with special prize opportunities for those who show completely finished projects from last year's classes. Several of my students told me they had finished their projects but didn't think to bring them to show. One did, though, and it was a stunner! Peggy took my suggestion of replacing the 9-patch centers with a 6-1/2" square. She fussy cut fruits, vegetables, and other novelty prints and chose matching colors for her star points/arrows. 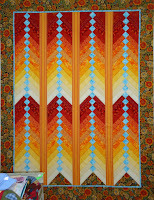 She also made the quilt her own by adding a contrasting 3-piece sashing between the blocks. 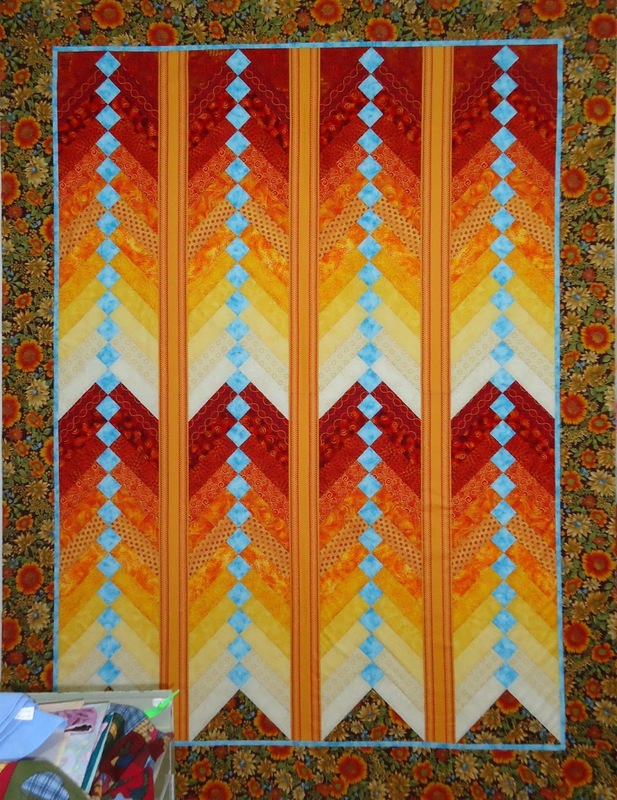 The sashing gives the quilt an entirely different look from the pattern. I admire such creativity from an octogenarian. Sweet Peggy in the red sweater in front. From the photo you can get a glimpse of my kitchen classroom! And can also tell what a fun group we had in class. I've been too busy and exhausted to post anything. Will try to catch up tomorrow. I wanted to avoid the heavy truck traffic on I-81 so I asked Gabby the Garmin to plot the shortest route, not the fastest, from Kingsport, TN to Ripley, WV. In the end I made it to Quilt Camp in plenty of time to get my classroom set up before the teachers' meeting, dinner, and opening festivities. I'm in the cooking and canning classroom! Wait till you see it. I'll post pictures in the morning. At least it's big and my class is small so we can spread out. Saturday dawned with showers looming and the further northeast we drove, the colder and gloomier it got. But we weren't daunted! We headed up to Abingdon, Virginia and made an early stop at the Abingdon Vineyard & Winery. Not too far off the interstate and relatively easy to find with good directions, but as we wound down to the winery we might have heard banjos in the distance ... just sayin'. The gentleman behind the counter was very informative and since we were the only ones in the shop we had his undivided attention. The site is lovely, though, alongside a babbling brook which flows into a larger stream beyond the trees. I could have taken a picture of my bed sheets and you'd have had the same impression! Nevertheless, we forged on to the top and made our way to the Visitor Center where we learned a little more about the geology and wildlife in the area. One thing I have to say about Virginians -- they are physically active, in spite of the weather. There were large groups of people gathering on the mountain to hike and bike. The Appalachian Trail winds through the park and there is a bike trail on an old railroad bed that goes through Damascus at the foot of the mountain. Tons of folks, dressed appropriately for the weather, having a great time in the great outdoors. We were at least 1,000 feet higher than yesterday when we were at Bays Mountain and we could see that Fall has fell up there (apologies, my dad was a Pogo fan). On the road up the maples had turned red and orange, but there was still a bit of green. When we were able to see the mountainsides, they were mostly yellow and orange with very little green. Back at the resort, watching football and getting ready to do some slow stitching on a binding. I can't say enough what a joy it has been to be away from home with my husband doing nothing in particular. I will try to report from my classes next week if I'm able to get on WiFi there. Otherwise I'll write my posts and log in when I get home next Friday. Hope you all have had a pleasant weekend! Main Man and I were in separate cars for the trip to Kingsport on Thursday since he will return home on Sunday when I go on to WV. So I took advantage of my solitude and made a side trip to Tennessee Quilts in Jonesborough where I did a little damage. My quest was to add some soft yellows and darker grays to the pack I had purchased in Indianapolis last month. I am using those in my Exploding Pineapple class step-outs and I like them so well I want to make a whole quilt in those colors. I stuck to my plan with only two exceptions. The yellow Handmaids fabric goes with panels my secret sister gave me last year. The diamond fabric -- well, I just couldn't resist it. Do you blame me? We scrapped our plans for golf Friday due to rain and an aching back (not mine). Instead we started our day at Countryside Winery. Sipping wine at 10 a.m. -- kinda like mass except you can go back for seconds! Our morning also included a drive through Warrior's Path State Park, a visit to the Gray Fossil Site and Natural History Museum (absolute fascinating! ), and a walk around Bays Mountain city park. The fall colors are just beginning in this part of the state. I managed to fit in a stop at Heavenly Stitches Quilt Shop in Kingsport where I added a few quarter yards to my earlier purchases. And that's the highlights of Day One. Bottom line: even though we went around several counties, it was a very restful day for both of us!